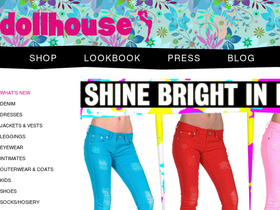 Dollhouse, online at Shop.Dollhouse.com, specializes in trendy clothes for juniors. Dollhouse sells jeans, boots, tank tops, leggings, coats, blouses, and tops. At Dollhouse, you can also buy dresses, underwear, jackets, pants, vests, rompers, robes, and skirts. You can also choose from lists of Customer Favorites, Our Favorite Things, and 10 Transitional Must-Haves at Dollhouse. You can find out about trendy fashions by reading the online Dollhouse blog as well. RetailSteal.com has the best Dollhouse coupons, Dollhouse discounts, Dollhouse coupon codes, and Dollhouse promo codes. Shipping and handling rates at Dollhouse depend on the pricing of your purchase and your shipping destination. See website for full details. Exclusions may apply. Use our coupon code at Dollhouse today to enjoy 25% savings on our online purchase. Shop boots and booties at Dollhouse today and use our coupon code to save 40%. Click our link to save $10 on your purchase from Dollhouse today. Simply enter our coupon code at checkout to enjoy this discount. Get a 20% discount on first orders orders from Dollhouse. Click link and use code. Get 15% off all orders at Dollhouse.com with the coupon code. Click link to save. Shop online at Dollhouse.com and enjoy a $50 discount on your order. Use coupon code on orders of $150+ to qualify for this limited time offer. Use this coupon code to save $15 when you spend $150 or more on your order from DollHouse. Click to save. At Dollhouse, save up to 60% in the sale section. Click link to shop online. Shop at Dollhouse and find gorgeous wedge sandals starting under $30. Shop floral prints and trends. Click here to save.